The Rocky Mount Meezers: It's My 15th Birthday! Today is my 15th birthday! I've heard that one cat year is equal to 7 human years, which would make me 105 years old, so if I would have thought about it sooner I would have tried to get on the Today Show to be featured by Willard Scott and Smucker's ... hee hee! Well, I was wrong, Fuzzy Tales said I'm actually about 76 in their comment, and gave me a conversion chart that shows it ... whew! Sabrina, that is why we love you so much, you are so funny and so sweet! Happy Birthday to you, our precious girl, we are so lucky we have you in our lives! Happy birthday, sweet Sabrina! We wish you many more happy years to come. Happy Purrsday Birthday Sweet Sabrina !!!! A very happy birthday beautiful Sabrina. Happy birthday, Sabrina! You're actually about 76 in humans years -- getting up there but still with plenty of time before you reach 100+! We wish you a wonderful day filled with extra treats and cuddles! Thanks Fuzzy Tales! I'd rather be 76 than 105 ... hee hee! We're gonna bookmark that link you gave us, too! Sabrina! Happy, Happy Birthday gal! I brought you this little box of fressh churchyard meeces - all 12 especially trained to provide maximum fun! Happy 15th Birthday, Sabrina!!!!!!!!! 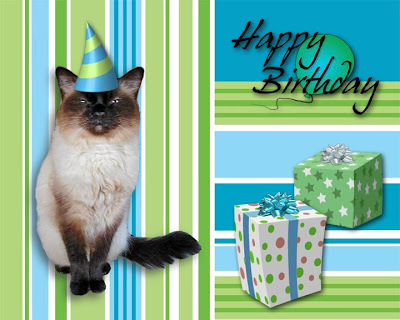 We purr that you get lotza "goodies"
Happy Happy Birthday, Sabrina!! We hope you have a great day!! You don't look a day over 5. I'll bring your treats as soon as I can get them all packed up. Happy Birthday! Let's all have some fishy flakes! Happy Birthday gorgeous Sabrina! We are so happy to celebrate this day with you!!! Hope you have a wonderful day! A furry happy purrday sweet Sabrina! Sabrina concatulations on becoming younger than 105 human years. You are looking very festive and lively in your picture. You are young yet Sabrina. Our Chica will be 20 this year. Have a fun day. Happy PurrfDay Sabrina! We're a little late so we hope your day was filled with wonderful treats and rubbins! Happy Birthday Sabrina and many, many, many mooooore!!! We love your Birthday picture!! Happy B-Day Sabrina! Hope you are here with us for a very very very long time so we can enjoy your adventures and look into those beautifull blue eyes! And James and Lars are right...beautiful blue eyes! Belated birthday greetings, Sabrina. May you have many, many years of happiness. We hope you had lots of treats on your special day. Belated Happy Birfday ta Sabrina! We were gonna say that there is some kind of sliding scale of cat ages, but we saw ya update that you got a linkie to that. Still, 15 is doing real good! It's mancat monday and it seemed very mancatly to come say hi to a very special girlfriendcat. Would you like to come over and snuggle on the gizzy?